CHICAGO, IL--(Marketwire - March 10, 2011) - Amlan International, a global provider of animal health products for livestock, gathered its technical, sales and marketing teams in Atlanta, Georgia, USA for an in-depth training session with distributors. As part of its strategy to educate livestock producers on the beneficial uses of its products, Dr. Fang Chi, Amlan's Technical Director, reviewed new clinical studies and field research with those closest to the market. Distributors representing Latin America, Asia and Africa/Middle East were in attendance. "Product awareness is one aspect of communication," said Dr. Ron Cravens, Vice President of Amlan International, "But product education is the most important. We believe that our customers deserve to know and understand how and why our products work. Our products are backed by third-party scientific research that comes from laboratories around the world. This allows us to honestly tell our customers that our products work in their livestock. We let the science tell the story." Amlan International sells Calibrin-A and Calibrin-Z enterosorbents sorbents for mycotoxins. Visit www.amlan.com to learn more. Amlan International develops and markets animal health and nutrition products used in the global livestock market. Amlan International is a Division of Oil-Dri Corporation of America, the world's largest manufacturer of cat litter and a leading supplier of specialty sorbent products for industrial, automotive, agricultural, horticultural and specialty markets. 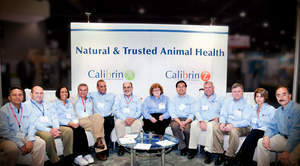 Attendees at Amlan's distributor training session at the 2011 International Poultry Exposition.